CD Replication Packages with 4C Printed Wide Jackets. 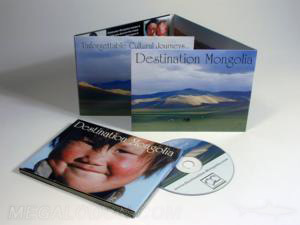 Look below for popular options for printed 4 panel and 6 panel CD jackets sleeves. Printing is full color on cardboard stock with your artwork. Jackets can have a variety of options such as extra pockets to hold 2 or more CD's, literature holders, business card holders, custom modified thumbholes, etc. A popular option is the tear off postcard. Available with recycled content and fiberboard! And if you don't see the cd package you're looking for, please ask, these are just the most frequently asked for packages!